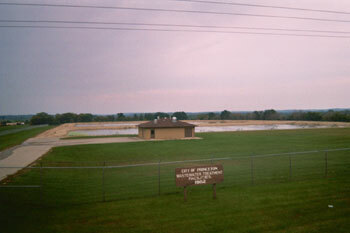 The effects of aging and stress due to community growth prompted failure of the Princeton wastewater treatment facility and necessitated its renovation. Compliance and regulatory provisions had also become an issue. To mitigate the effects of the failing system and upgrade it for the long term, existing pond liners and aeration equipment were replaced and a new polishing pond was constructed. The wastewater treatment facility work was included Phase II of the projects funded through a USDA Rural Development grant that Kunkel Engineering Group assisted in procuring for the City of Princeton. The other projects completed as part of this USDA Rural Development funding package included the Water Street Reconstruction, Fourth Street reconstruction, Highway 73, Highway 23 and the construction and installation of the Well #1 and #2 Radium Treatment Facility.